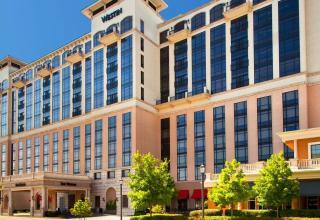 The 232-room Westin Huntsville is the only AAA 4 Diamond hotel in Huntsville! Blending sophistication, elegance, and classic southern hospitality with the world class shopping, dining, and entertainment of Bridge Street Town Centre, The Westin has long been the favorite for business travelers, local clientele, and vacationing visitors. Partnered with The Element by Westin, which occupies the top floors of our building, the complex offers the largest number of guest rooms under one roof in Huntsville, with 382 rooms. The Westin Huntsville recently completed a $7 million renovation that included all public areas, all guest rooms, and even added additional one-bedroom suites on our top floor. The Westin offers programs and amenities that uniquely position us to ensure our guests have the most relaxing stay in Huntsville, including our Heavenly Beds, our Heavenly Showers, 24-hour In Room Dining, Starbucks Coffee in our lobby, the incomparable Westin Workout Center featuring a Peloton bicycle, and our indoor-outdoor saltwater pool. The Westin is currently constructing new meeting space that will be unlike anything else in Huntsville. The Valencia Ballroom is scheduled to open in April 2019, and will feature 3,400 square feet of flexible space, dividable into 4 smaller breakout rooms. All rooms will feature an exterior glass wall, providing natural light and an unobstructed view of Lake Bridge Street. Located within Huntsville's Cummings Research Park, the second largest technology center in the United States, and less than three miles from the U.S. Space and Rocket Center, our hotel offers everything a business traveler demands and everything a vacationer desires. The Westin Huntsville is an integral component of one of Huntsville's finest mixed-use development. Description The Westin Huntsville invites you to indulge in Huntsville's only Four-Diamond hotel. With a total of ten beautifully appointed meeting rooms and over 13,000 square feet of meeting space this is the perfect venue for Huntsville events, conferences, board meetings, galas and more. Our 7,992 square-foot Mediterranean Ballroom is divisible into six sections. The pre-function space, which is perfect for elegant receptions, features stunning views of the Bridge Street Lake and Courtyard. Our accomplished team of culinary professionals provides innovative cuisine creating a feast for the senses. The Westin Huntsville's experienced Sales and Catering department will ensure each event is an exceptional and unique experience. Our business center will put your mind at ease while you are away from the office.